Truthfully we had gone to Granada to buy chorizo for Rosa’s birthday barbecue, because ‘Graná’ has THE best chorizo in the world. Depending on your level of carnivorous tendencies this foto is somewhere between entirely repellant and the sultry song of a siren. 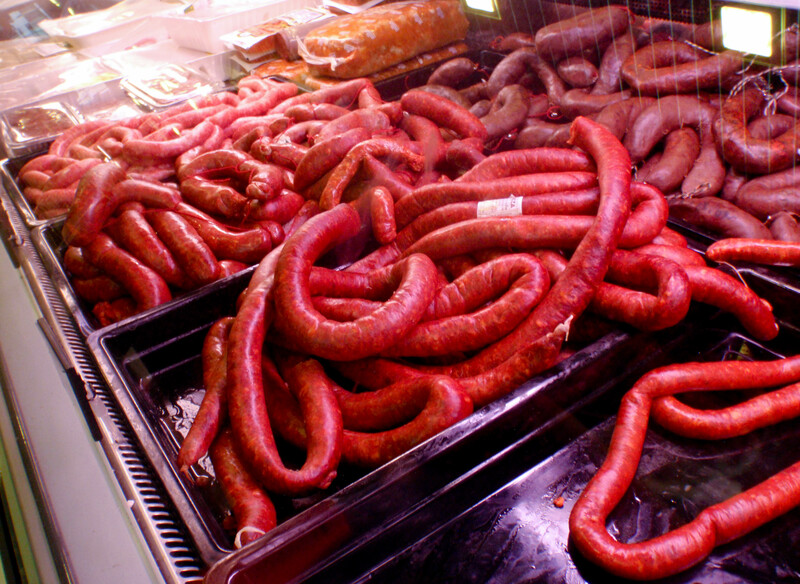 We ended up buying about 13 pounds of meat – marinated chicken pinchitos, chorizo, a similar sausage called longaniza, and salchichilla – a mild sausage for grilling. 5.5 kilos is A LOT of sausage. More than I thought. But really, you can’t take a trip to Granada only to buy chorizo. Well yes, but if you are going to spend three hours in the car one way, you might as well take advantage of other perks of the city. Like traffic jam olive tree pictures. 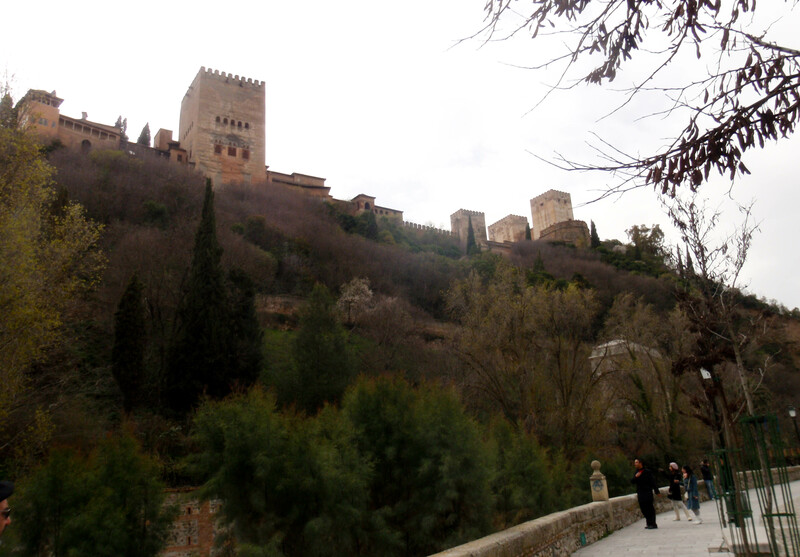 Granada is a wonderful city, probably one of my favorites in the world. It was the last stronghold of Al-Andalus, the last Muslim reign of the Iberian Peninsula, falling in 1492. If that sounds familiar, it’s because Christopher Columbus petitioned Isabella and Ferdinand for money for his trip to ‘India’ while they were enjoying the spoils of war in the freshly conquered Alhambra. Isabella was only too pleased to slough off her now redundant army and convert them into a conquistadors of a different land, as she was indeed aware that there was a rather large landmass in between Spain and India in that direction. 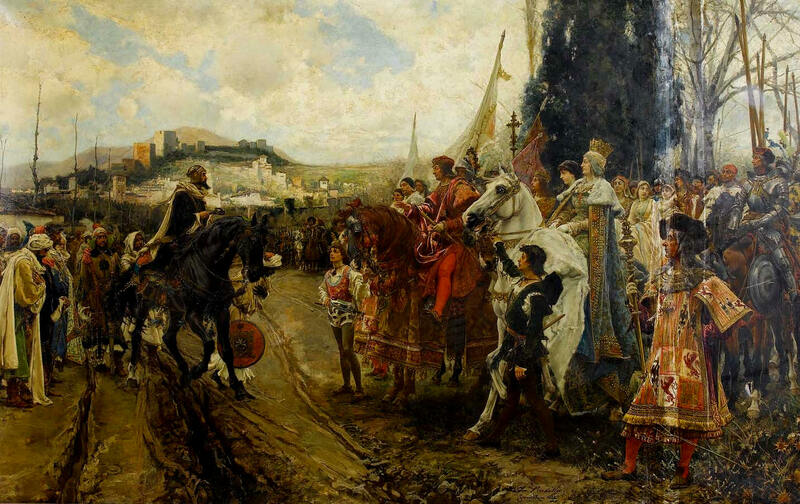 This is a famous painting of Boabdil (Abu Abdullah version we-won-so-we-call-you-what-we-want), the last Moorish king of Granada, handing over the keys to the city to the Catholic Monarchs Isabella and Ferdinand. Boabdil is said to have turned over Granada peacefully upon surveying the invading army, accepting the inevitability of the defeat that had already crept over the rest of the realm. He loved his Granada, the intellectual and cultural gem of the land, and he was so devoted to its preservation that he accepted the loss of his era in exchange for a promise that the city would remain un-ravaged, that it’s beauty would continue without him. Heartbroken, on his final ride out of the city, he turned back on the top of a crest to look back on his palace and let a few tears fall in regret and farewell. Seeing this his mother had a few words of comfort to offer: “Weep like a woman for the city that you failed to defend as a man.” Thanks, Mom. 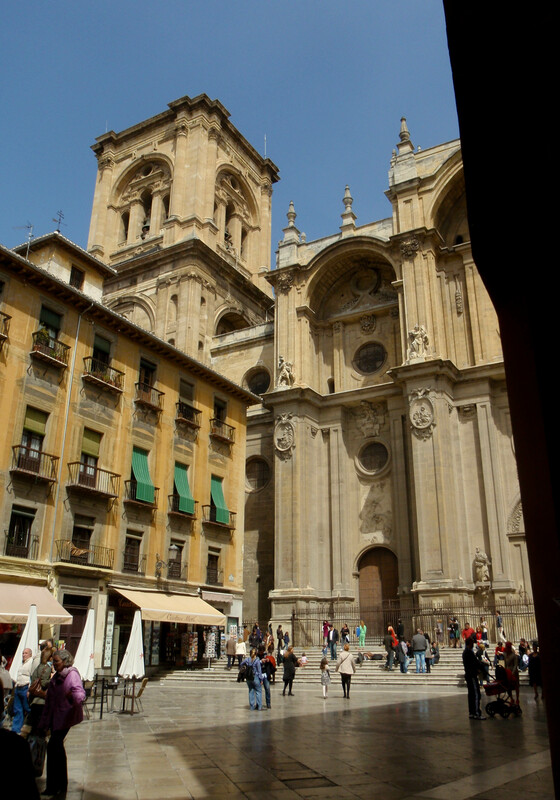 Today, Granada has attained a strangely fluid mix of this rich past and European modernity. They are proud of their traditions and cultural heirlooms, but it doesn’t hold them back from developing and expanding their identity. Lots of little touches to remind you that you ARE in Granada. Sometimes strange to think that the city is named Pomegranate. But this is a food blog. So it shouldn’t surprise you that the faithfully preserved tradition that I want to talk about for the rest of this long-winded passage is actually tapas. Hence the title. 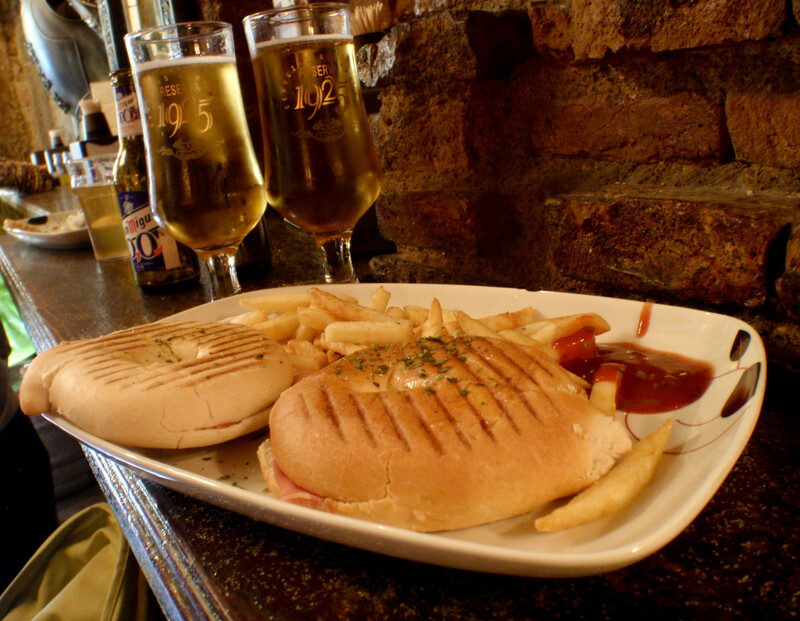 Granada is one of the few remaining cities in Andalucía that adheres to the original system of tapas. You buy a drink, you get some food. Buy another drink, get some more food. 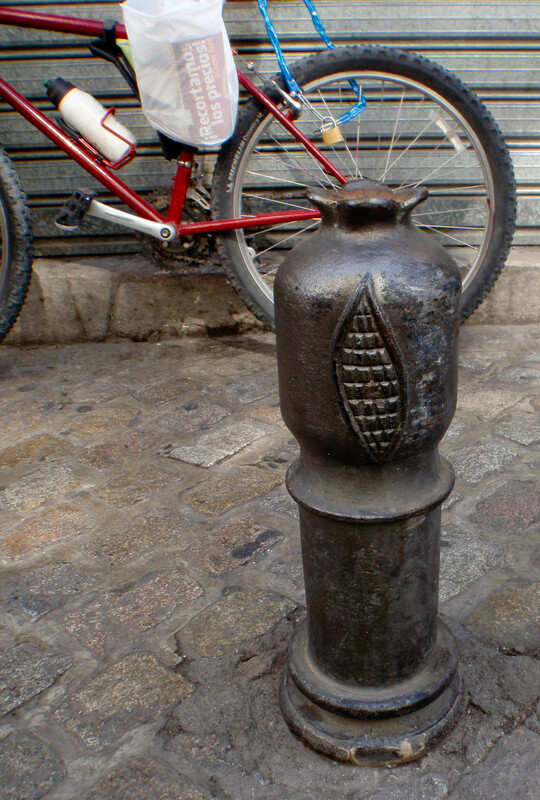 Here in Sevilla sometimes you’ll get some olives or nuts, but it’s not guaranteed by any means. 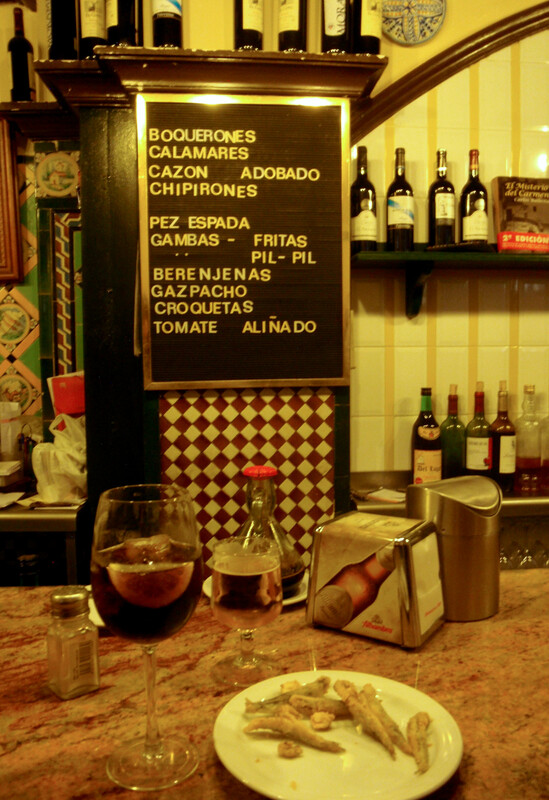 It’s easy to get your hands on tapas, but you do have to ask and pay separately. 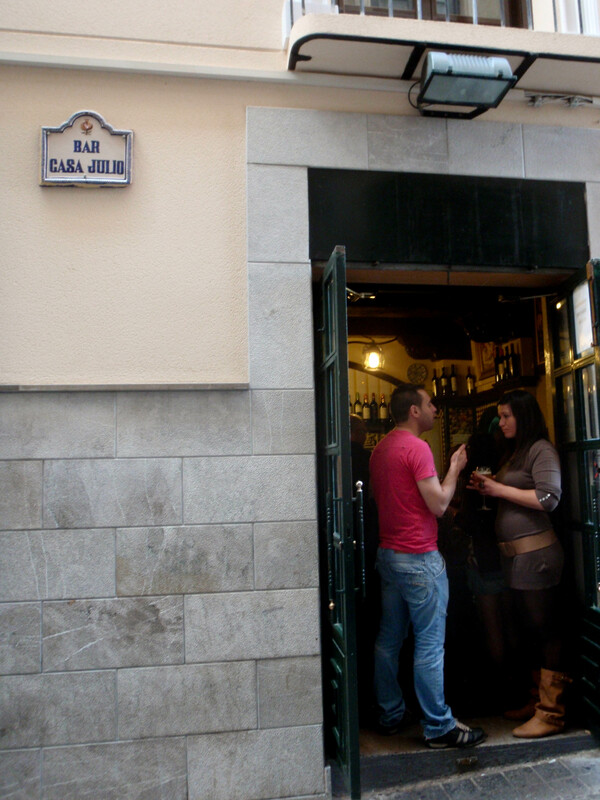 In Granada, the drink will be a bit more expensive, but it’s coming with food. Let’s take a look at where Rosa took me, all of them right around Plaza Nueva. 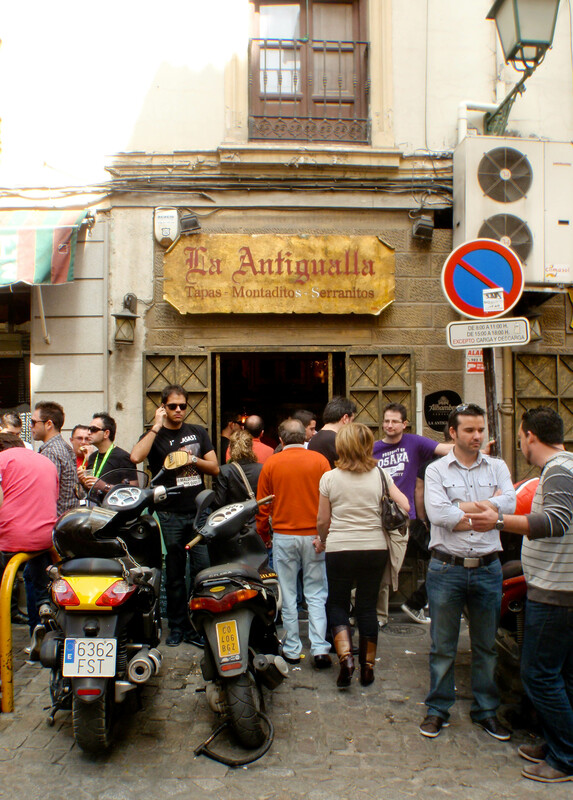 La Antigualla is just off Plaza Nueva, heading up to the street of teterías, or Arabic style tea shops. The fun thing about the Antigualla is that it has a series of tapas of the day, depending on what’s fresh and what kind of mood the chef is in. 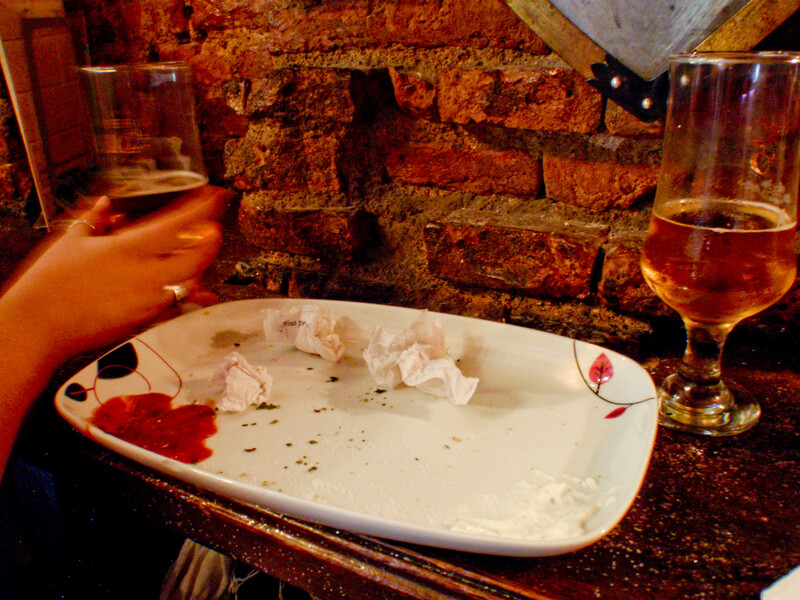 You get your first drink, you get the first tapa. Decide to repeat? Something different! And so on. Luckily we got in just before the rush pictured above and slipped into a little gap on the countertops surrounding the tiny little room. A lot of good tapas places will not have sit down tables, but tall tables and countertops to stand around. Too many people cram in for there to be seating. Our first tapa accompanied Alhambra beer, of course. They were little flat bagels with olive oil, grated tomato, and serrano jamón. Sound familiar? Wonderful french fries (especially since they were wildly off-diet) were paired up with ketchup that we ignored in favor of a mild garlic alioli. Maybe. Cost? 5 euro. That’s right, suckers. Having devoted the whole day to a leisurely eating extravaganza, we tooled around the city to walk off the bread and prepare for stage two. After that warm-up, we set off for our true destination: Bar Casa Julio. It’s tucked away in an even smaller side street of Plaza Nueva. You can find it between a kebab shop and a Japanese take-out place. Just look for an abandoned-ish alley with some lonely beer barrels by a few half-hidden doors. This is where Rosa’s father took me and where I will probably go every time I can scrape up the gas money to get to Granada. Some things you should know about my eating habits before reading on: I am picky (tiquismiquis for you Spanish speakers, should you stumble here accidentally) about my fish. I am not a fan of fish skin, and I prefer milder, less fishy tasting fish. I try to like a lot of things, but no one’s perfect. Furthermore, I don’t love molasses. I find it cloying and overly intense. When a recipe calls for it, I almost always skimp in order to taste everything else better. I am also iffy on eggplant. I will choose lasagna or shepherds pie over moussaka any day. I believe it’s the texture more than anything and it’s tendency to slurp down cooking oil like it’s stockpiling for a bio-diesel crisis. Guess what we ate? Boquerones. These were the tapa of the day at Bar Casa Julio. 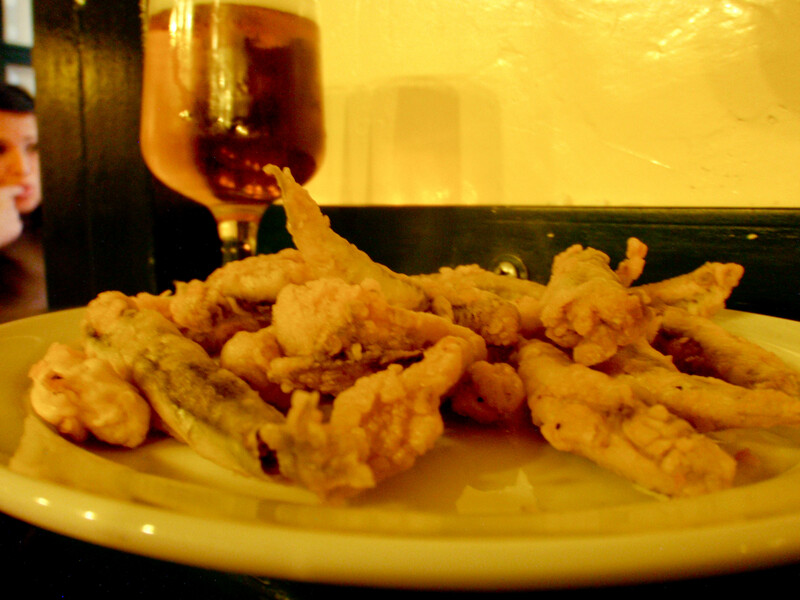 Boquerones are European anchovies, whole, battered and fried. I apologize for the lousy picture quality, but at this point our table was a shelf on level with our heads, and there is only so much you can get out of mood lighting and a gorilla grip tripod-ette balanced against your chest. But anyways. Yes, I ate anchovies. I still can’t believe it, either, as I am a child raised not to recognize the little fishies outside of jokes about lousy pizza. When they are fresh like these, the anchovy actually has a very clean flavor. I could actually avoid thinking about the fact I was eating little creatures whole until my last bite, which was unfortunately the literal tail end of a larger anchovy. Scales are not. Tasty. Thank you, Alhambra cerveza, for freeing me from that unpleasantry. Rosa admitted that she had been avoiding the larger specimens for just that reason. Duly noted. Eventually we finagled a spot at the actual counter. As you can see, the base menu is just that – basic. 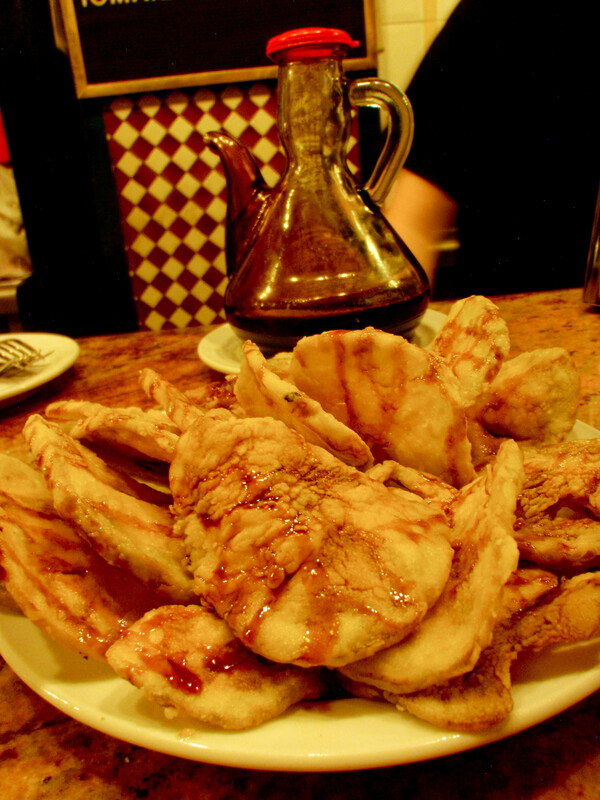 When I was here with Rosa’s father, the featured tapa was cazón, or dogfish as I’ve said before. And as I’ve also said before, delicious. It’s like this restaurant is snickering to itself, intent on disproving every opinion I’ve held on what I do and do not want to eat. Overly dramatic? No. Because next, we ordered the highlight and reason for the trip. 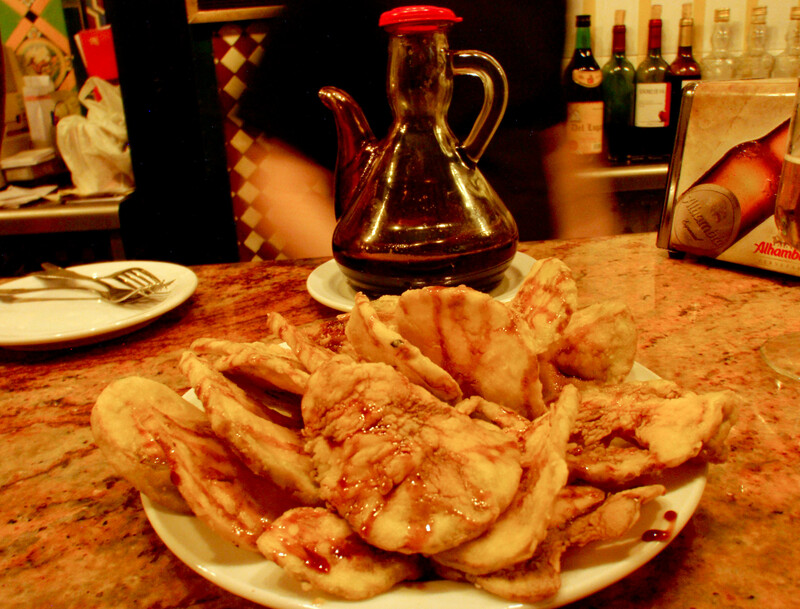 This is one of the most traditional tapas in Andalucía – Berenjenas con miel, or eggplant with molasses. FYI – miel is literally honey, but here molasses is not called melaza but miel de caña. Sugar cane honey. Poetic, no? 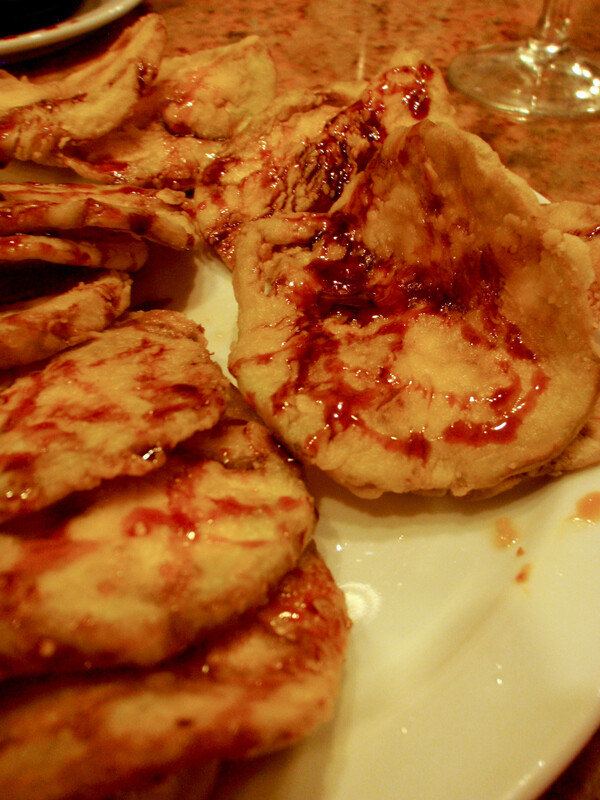 In this restaurant, wafers of eggplant are ever so lightly breaded, fried, and then piled on a plate and delivered with a bottle of molasses to drizzle ever so slowly on top. By slicing the eggplant so thin and frying for a very short time the result is a crispy, salty crust hiding the tenderest interior ever. The eggplant almost melts on your tongue, buttery and sheer pleasure in contrast of textures. The molasses adds a dark sweetness to the experience, it’s smokiness taking away any suggestion of too much salt or grease. Add the bubbly bitterness of beer and you have a distinct, perfectly rounded reason to close your eyes and concentrate entirely on your senses of smell and taste. By this time we were pretty full and looking for a change of pace. So we found a bench in the sun and basked in the sun like gossipy lizards. Then we hunted down a tetería. If I were not rather broke, these things would now be found in my apartment. I love this style of tea. It is simply spearmint leaves steeped in hot water with sugar to taste. Spearmint tea does make you feel better about the world, with a happier stomach and a warmth in the bones, refreshed. In Spanish it is hierbabuena or the good plant. I agree. 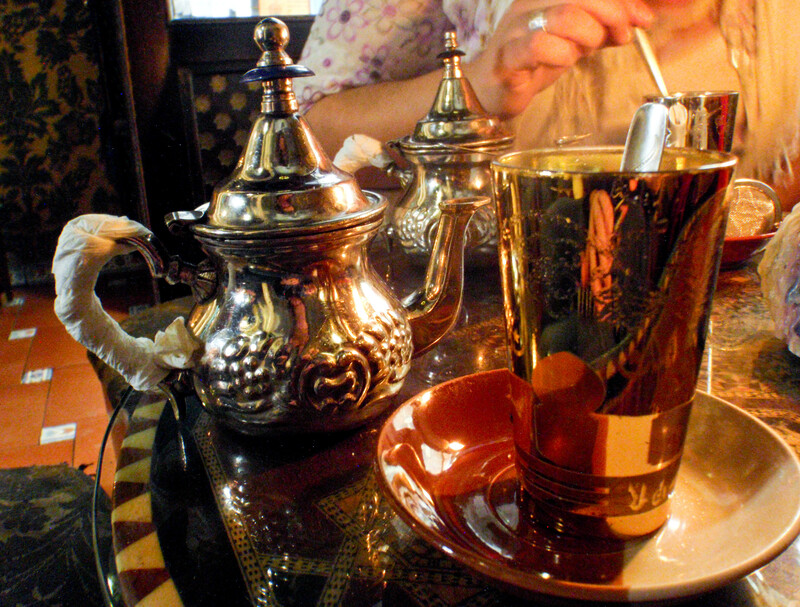 For two euros, I got three cups of relaxation from an ornate silver teapot. While I may not have the beautiful glass cups, I am now raising my own little spearmint plants and feeling very adult and houseproud. Before heading out of town, as the afternoon heated up, we only had one more stop to make. Los Italianos. Los Italianos is *the* gelato joint of Granada. Because we forgot the cooler we were unable to buy their famous ice cream cake, but Rosa has sworn that it is only a postponement, not a permanent loss. 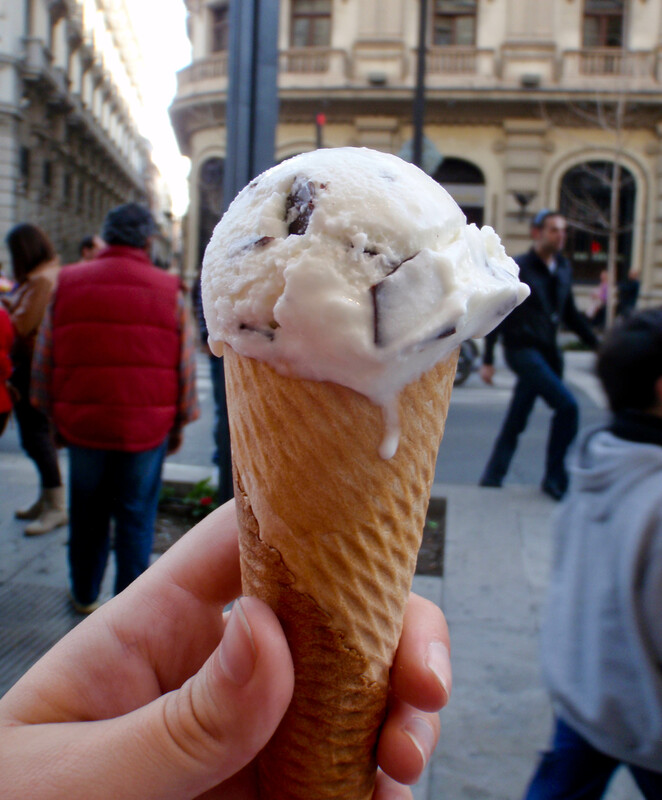 I opted for straciatella because it is awesome. 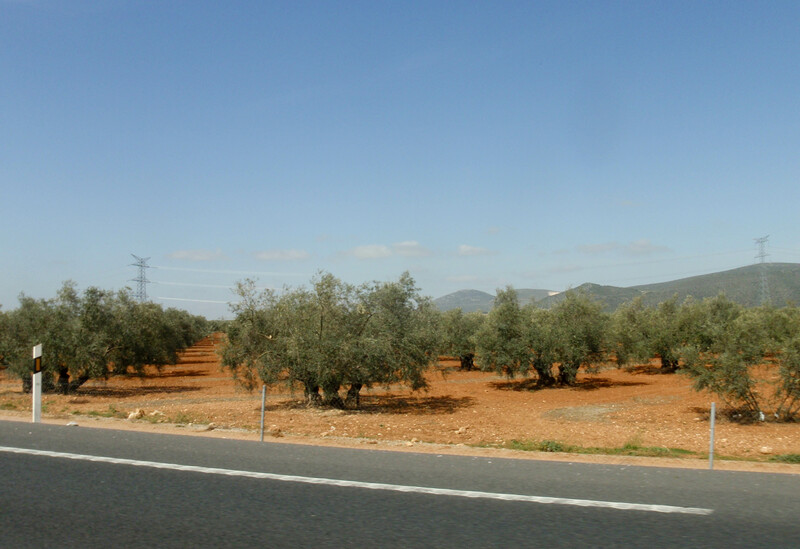 After that, we packed ourselves into the car, surfeited of delicacies of Granada and wended our way back to Sevilla as the olivos slipped by. 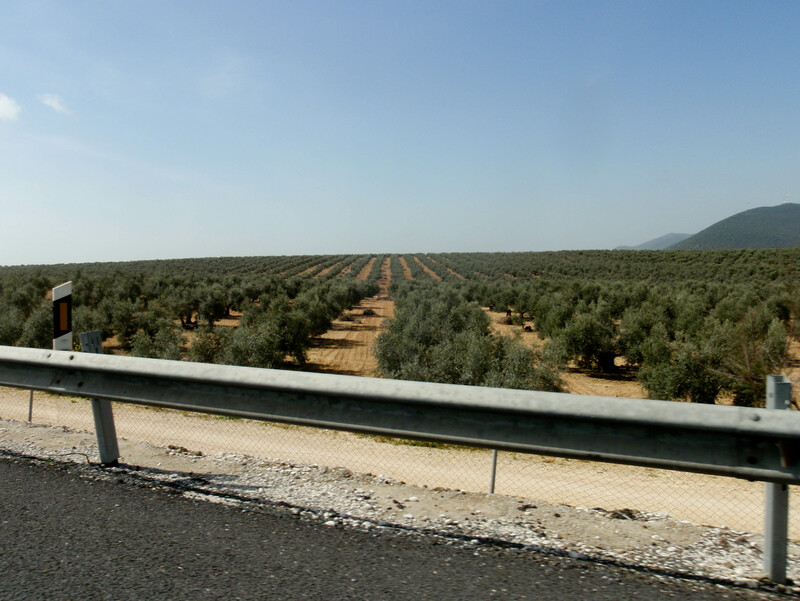 Seriously, there are a lot of olive trees between Granada and Sevilla.